Everyone wants to earn only high returns from their investments. The problem is, high returns mostly come from high or medium risk investments. And that’s only natural. If all investments provided equally high returns, they all would be worth nothing. The degree of risk differentiates low and high return investments. Without a doubt, returns from high risk investments are bigger. Nonetheless, can low risk investments provide a higher value to investors? Low risk investments: more for less? Low risk investments generally are viewed as “investments for beginners”. Low risk investments look unattractive because of the simplicity of their returns structure. Their lower risk also contributes to a less noticeable mystique, in contrast to high risk investments. Forex, solely because of its high investing risk, has become a field which produced thousands of writers and teachers. Bonds, which aren’t high risk or complicated, haven’t spawned a famous internet persona. However, low risk investments like bonds, savings accounts, and low risk ETFs are underappreciated without a worthwhile cause. Their best side is low entry costs and low per unit prices. Higher risk investments are often more expensive. Participating in a hedge fund may cost upwards to 17% and 1.39% (performance and management fees) of the total sum invested in a hedge fund. That’s a big cut. It looks even less justified with declining hedge fund gains over the years. Low risk investments also often have lower per unit prices. A ITM (in the money) call option may cost upwards to $1,000. Most low risk investments like savings accounts are either completely free, or come with a low per unit price (bonds, low volatility ETFs). Low entry costs and low per unit fees are important in investing. That’s because they play a role in investment returns. Investing costs add to the total of growth an investment has to achieve to become profitable. More expensive investments have to achieve more growth to become profitable. Let’s see how this works in practice. An investor chooses to invest in France’s 11-year bonds (July 2030 expiration) and an average hedge fund. The cost of one bond is 113.99 euros (as of December 2018) and the management fees are 0 euros. The commission fees for the brokerage would be around 1% to 5% of the total price of the bond. In total, for the investment to become profitable, the bond price has to grow by 5.70 euros. Or, by 5%. 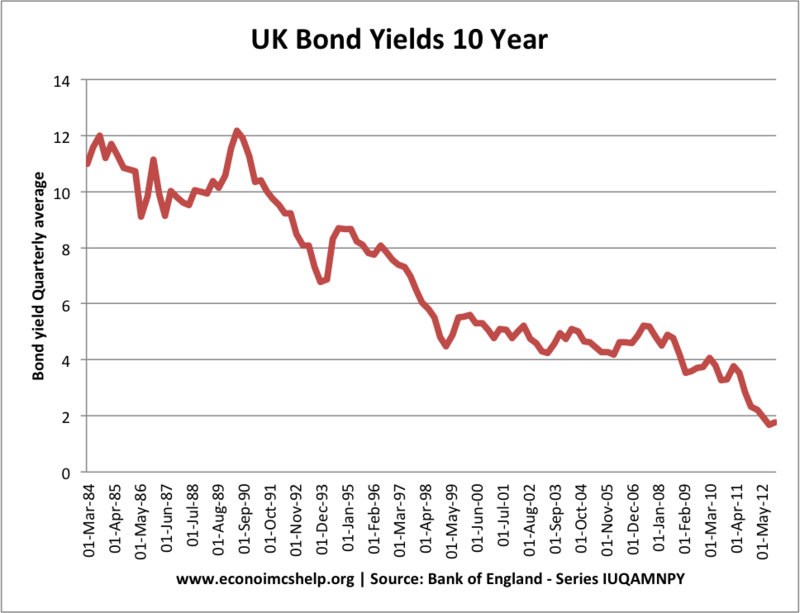 The growth figure does not include the bond’s yield (0.7%). The average yearly management fee for a hedge fund investment would set back the investor by 1.39%. The outperformance fee at an average hedge fund hovers around 16%. An investment in a hedge fund has to grow more than 1.39% to become profitable. It also has to increase enough to justify the double-digit outperformance fee. Moreover, the average growth achieved by hedge funds is 2.6%. That’s lower than the average year-on-year growth of the S&P 500 index has been for the last 4 years (12.64%). Year on year S&P 500 growth from 2014 to 2018. Copyright: Money Bear Club. Low risk investments still have a probability of declining in value. Yet, the probability that this could happen is low. Low risk investments not only have a low risk. The growth in value required every year is smaller compared to high risk investments. An investor investing in a low risk investment will face lower risk. They’ll also enjoy smaller growth in value required for the investment to become profitable. The main disadvantage of low risk investments is their smaller profits. However, investing larger sums of money will create higher returns (with comparatively lower risk) from low risk investments. That’s how low risk investments can create more value. A low risk investment portfolio is based around investments which have low to very low risk rates. The investment portfolio risk will largely depend on the types of investments chosen, rather than the time of investing or the market conditions. However, they do have the ability to create an impact on the whole portfolio. Time of investing can create an impact to the portfolio. This often happens in the case of changing market conditions. A full-on bear or bull market brings a more clear future investing perspective. Changing market conditions, however, can bring uncertainty to the investors. The transition between different market conditions could be the period, when investing in low risk investments is equally advantageous and disadvantageous. On one hand, uncertainty in markets could spell trouble for investors of government and municipal investors. In periods of uncertainty, the Fed has chosen to lower maturity rates on bonds. Other governments have also followed this practice. US bond rates since 1960. Source: http://4.bp.blogspot.com/-dJlK_fdMYcc/UOt-Ihx-92I/AAAAAAAAAEM/rjBSpoiCbT0/s1600/rates.gif. On the other hand, the periods right after market downturns are the perfect opportunity to invest in bonds. This happens because maturity (yield) rates of bonds are increased right after a market downturn ends. Other conditions can also make an impact on a low risk investment portfolio. These are conditions like statements from politicians or trade relations. Top 20 ETFs and the lower returns in the last 3 months. Source: http://news.morningstar.com/etf/lists/ETFReturns.html. Deciding on appropriate responses to market signals. Researching low risk investments should take up the bulk of effort when creating a low risk investment portfolio. The right choice of investments can make profits an easily achievable goal. A bad choice of investments will not only set back the investor financially, but also could dissuade from investing in the future. Deciding in which low risk investments to invest in, should be done after researching them. The decision should be made by evaluating investments by their risk, profitability; the current economic climate, and future perspectives. Speculation about future perspectives often takes the first place in investment decision-making. Yet, very few people are able to correctly guess the future. Moreover, the investing environment changes every day. Predicting what will happen in a year or two, is almost impossible. Nevertheless, it’s important to take into account that a low risk investment likely won’t experience a radical change in 12 months. Thus, it’s better to allocate only a small amount of effort to the evaluation of future perspectives in low risk investing. The past performance of an investment shouldn’t be used as the only indicator for the future. However, an investment which has been on a decline for a significant amount of time (6+ months), rarely will be a good choice. Hence, the profitability of an investment should be evaluated based on its past performance, investing fees, and the average year-on-year growth. The risk of an investment won’t play a big role in a low risk investment portfolio. The difference between very low risk and low risk investments is negligible. Investing in bonds or index funds carries a very small difference in risk. It shouldn’t be overlooked, but it also shouldn’t be the main criterion. Other criteria, like profitability and future perspectives, should be evaluated and researched more. The current economic climate is an important area to evaluate before deciding on a low risk investment portfolio. A bad or a worsening economic climate, won’t make a good impact on low risk investments. Very low risk investments, should take up the majority of a portfolio in bad or worsening economic climates. It’s easy to climb out of a loss making position in a bull market. It’s harder to do that in a bear market. Hence, very low risk should be a priority in times of market decline. An exit strategy and the time frame are closely tied. One of the pieces of an exit strategy can be a time frame. And a time frame for an investment can be dependent on an exit strategy. Low risk investments, since they experience overall lower price volatility, often have longer investing time frames. More so, compared to high risk investments. The exit strategy for an investment is often based around minimizing losses. This works great for high risk investments. However, for low risk investments, an exit strategy should be based around the profits an investor wants to take. To simplify, the strategy should focus on the date a certain amount of profits is achieved. This rather bold exit strategy only works for a low risk investment portfolio. Choosing the best brokerage or an online trading platform for low risk investments largely depends on the trading options it provides. Some platforms just don’t provide trading for low risk investments. The ones which provide it, are mostly older and bigger brokerages. Commission fees also play a role in the choice of a trading platform. Lower commission fees will make profits an easier goal to achieve. Deciding on appropriate responses to market signals largely depends on the investor’s risk tolerance. The lower it is, the more the investor will respond to negative market signals (negative news and analyses). Because statistics show that a consistent investment will grow more than an inconsistent one, holding instead of selling is the best response to most market signals. S&P 500 investing returns. 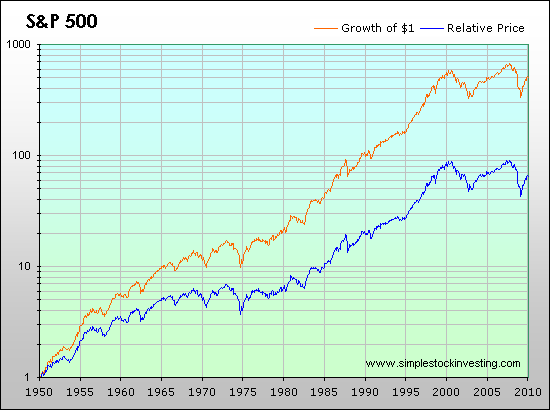 Source: http://www.simplestockinvesting.com/images/SP500_total_return.png. Early investing benefits. 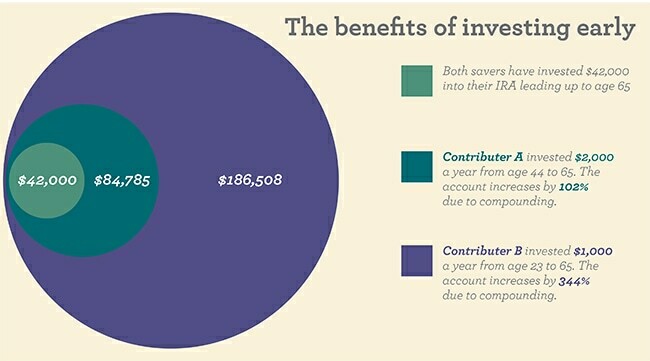 Source: https://www04.wellsfargomedia.com/assets/images/informational-graphics/screenshots-thumbnails/investing/retirement/goals-retirement/chart-benefits-investing-early-500pxw.jpg. Market signals are missed because most market signals have some form of relation to low risk investments (savings accounts, bonds, mutual funds). Hence, investors with low risk portfolios choose to ignore them, rather than to overreact. For low risk investments, it can be easy to miss the signals which require taking action. With the amount of news and financial statistics released every day, few investors can filter out the important information. In the case of a low risk portfolio, market signals related to government statistics or federal banking should be a priority. Investors should know the basic mistakes to avoid when creating a low risk investment portfolio. The first mistake is forgetting to diversify the portfolio. The thought about diversifying a low risk portfolio rarely comes to mind. Many investors think that diversification is only needed to offset the risk that comes with high risk investments. Yet, portfolio diversification also acts as a tool that helps to lock in higher gains. Some investments may not gain as much in value as others. With portfolio diversification, it’s possible to minimize this impact. Even better, portfolio diversification helps investors to be more flexible. The more diversified a low risk portfolio is, the easier it will be for the investor to buy or sell. With low portfolio diversification, deciding to buy or sell will be a harder decision. The second mistake is a portfolio that chases gains rather than value. A low risk investment portfolio should not be used as a tool to achieve 50% gains. Low risk investing is about generating value from steadiness. A common mistake is sticking to the most popular investments. Only investing in government bonds or low risk ETFs isn’t the best decision. Municipal and corporate bonds, certificates of deposit and money markets, are lesser-known low risk investments. They can potentially offer better low risk investing opportunities. Bonds are defined as debt instruments individual investors can invest in. Investors loan money to governments, municipalities, and companies. For that, they receive bonds (loan certificates) in turn. Bond owners get paid the interest (yield) on the “loan” they have given. Bond investors are often viewed critically by investors who prefer higher returns on investments. This view has its merits, but it is rather incorrect. Out of all available investments, government bonds and savings accounts are the only investments with close to 100% certainty that the investor will get their initial investment back. Developed nations sometimes even release bonds with zero yield rates, like Switzerland has done. This means that the probability the government might not be able to pay its debts is so low, that the investors are willing to accept a 0% yield rate. Instead of interest, the investors make money from the price fluctuations of the bond. Swiss 0% yield rate bond and its price. Copyright: Money Bear Club. The value of bonds is not only dependant on the economy and the debts of a country. 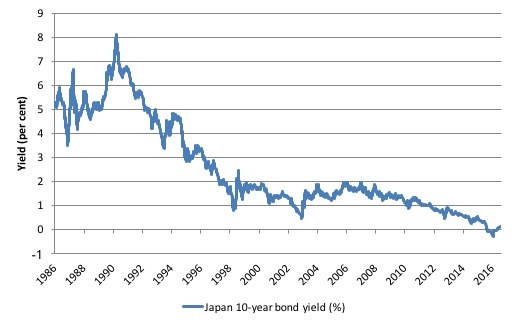 Interest rates, which are chosen by central banks, also play a role in the value of bonds. Higher interest rates mean higher returns on investments for new investors. For those who already own bonds, this could mean lower returns on their investments. Vice versa, lower interest rates can be a good selling opportunity for investors who already own bonds. When interest rates fall, new investors are willing to pay more for bonds with higher yields. Are mutual funds good for long term investing? The question “are mutual funds good for long term investing?” often pops up in investing forums and websites. Mutual funds are low risk investments that are often used as a tool for long term investing. Mutual funds are good for long term investing, in cases when the investor prioritizes low risk over fees. Mutual funds, in contrast to ETFs, have higher management fees and have entry fees. Differences between mutual funds and ETFs. Copyright: Money Bear Club. For an investment in a mutual fund to become profitable, there have to be positive gains. Besides, they should also negate the fees. If this happens, then a mutual fund can be good for long term investing. This means that the choice of a particular mutual fund is the most important decision. Fund investing success largely depends on the fees an investor has to deal with. High fees could “eat up” the profits gained from investing in a mutual fund. Mutual funds are good for long term investing if an investor is aiming for diversification. Since mutual funds are inherently diversified investments, investing in them could be a smart move. From the perspective of long term investing (10+ years), diversified investing can be better than investing with a narrow focus. The more diversified a portfolio is, the smaller the probability that the investor will experience losses (from the whole portfolio). One investment losing value would be a disaster for an investor who invests just in 2. 10 investments losing value wouldn’t be a tragedy for an investor invested in 100 of them. Thus, mutual funds, with their inherent diversification, can be a good choice for long term investing. Any investment is characterised by its risk, fees, potential gains, and accessibility. A high risk investment is valuable because of its potential for big gains. However, a low risk investment is valuable because of its low risk, low fees, medium potential gains, and an easy accessibility. From this, it’s apparent that the difference between them lies not only in their numbers. *- Money Bear Club may receive a referral fee (at no additional cost to the buyer) if a purchase is made by using the links.